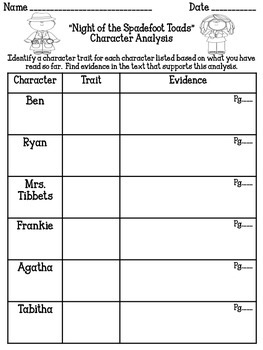 This file includes a character analysis chart for the major characters in "Night of the Spadefoot Toads" The chart allows students to analyze six of the characters by assigning a character trait as well as finding evidence in the text which supports the trait. 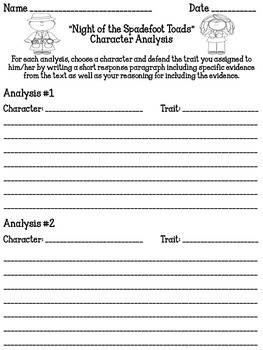 To develop this work further students are given an opportunity to prove their analysis by writing a paragraph to prove their assignment of each trait for two characters of their choice. "Night of the Spadefoot Toads" is a mentor text in Unit 1 Module A for the Fifth Grade Ready Gen program.